If the aging process has taken its toil on your face, your lips are likely included. Although some people are born with thin lips, it is common for the lips to lose volume and sag at the corners as we get older. This can project a sad or angry expression and it counteracts any hope of your lips looking sensual and defined. You also may notice that your lips hide more of your teeth and the distance between your upper lip and nose is lengthened. Why does this happen? Just like other parts of our face, the collagen gets depleted, the muscles weaken and the skin loses elasticity as we age. These all work to create the aged appearance we notice on our lips. Fortunately, you do have lip enhancement options when it comes to restoring volume and youth to your lips – both surgical and non-surgical. The common non-surgical treatment for thinning lips is an injectable filler. A board certified facial plastic surgeon can determine which type of filler to choose, how much to use and exactly where it should be placed in order to achieve the most natural results. Choosing an experienced plastic surgeon is very important; otherwise, you may end up with over-injected lips that look very unnatural. 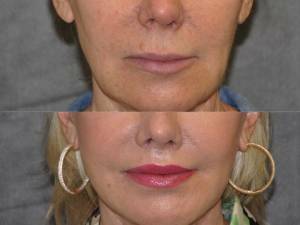 Using a non-surgical filler treatment can be effective to plump your lips. However it is not a permanent solution and it cannot fully address the signs of aging around your mouth. The most successful way to address thinning and sagging lips is with an upper lip lift. There are many techniques available and Dr. Talei is well qualified to perform the most advanced methods. The bullhorn lip lift (or subnasal lip lift) is the most common. It is used to reduce the length of the upper lip, add volume to the lips and restore balance between the upper and lower lip. During this procedure, a tiny incision is made just beneath the nose (similar to a bull horn). A small strip of skin and tissue is removed and the muscles are tightened. Next the upper lift is slightly raised to a more attractive, youthful position. Patients can typically receive a bullhorn lip lift under local anesthesia. Scarring is unnoticeable and recovery time is short. If you have not reached the point of thin lips, yet you want to avoid this unwanted feature as long as possible, then it is best to eat a healthy diet, exercise regularly, use sunscreen and avoid smoking. These are all factors that can accelerate the aging process in your face, including your lips. « Do I Need Cheek Lift or Facelift?